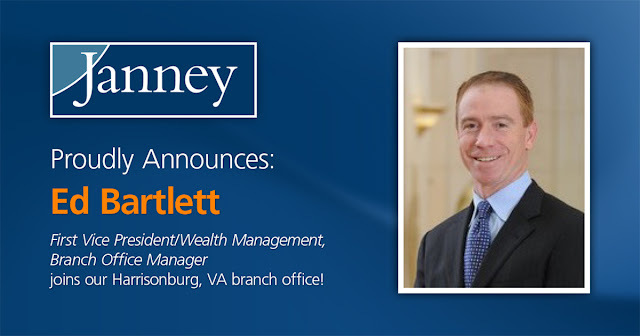 Philadelphia, Pennsylvania – November 14, 2016 – Janney Montgomery Scott LLC (“Janney”), a leading full-service wealth management, financial services and investment banking firm headquartered in Philadelphia, PA, today announced that Edward A. Bartlett has joined the firm and been named First Vice President/ Wealth Management and Branch Office Manager of its Harrisonburg, VA location. Bartlett joins Janney from Wells Fargo Advisors, LLC where he managed over $100 million in client assets. Bartlett will be entrusted with growing the firm’s presence in the Harrisonburg market and will also seek to expand its presence into Roanoke, VA, where he has lived since 2002. In addition to Bartlett, Sandy Arnold joins Janney as Senior Registered Private Client Assistant. Bartlett graduated with a degree in Political Science from Miami University in Oxford, OH and began his career with Wheat First Butcher Singer in Williamsburg, VA in 1994. He currently serves on the Board of the Roanoke Star Soccer Club, and recently presided as President of CCA Marlins USA Swimming club at North Cross School.